So, while Roswell has been busy putting money in its piggy bank, our neighbors around the region have been encouraging exactly the walkable lifestyle that we are saying we want.. Here's a tour of what our neighbors have done or are up to currently..
Alpharetta is building a town green in front of the new city hall. There will also be a new park, parking garage and library on the property along with mixed use buildings flanking the green. If one green in Alpharetta wasn't enough, we are putting this on one for effect. It is not publicly funded but it is publicly supported and it will be an iconic part of the Avalon development. 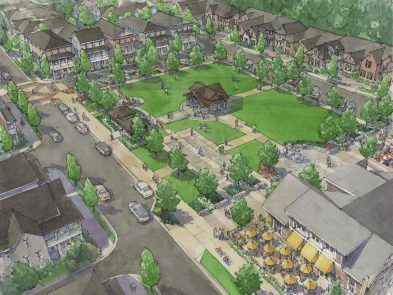 Sandy Springs is moving forward on the master plan that they adopted back in 2012. This segment is where many of you may know as the old Target shopping center. As you can see, there is a nice public green that will be added next to a parking deck and office that may be the new City Hall. The city of Dunwoody is currently building three new parks as part of the Project Renaissance that borders the Georgetown area on the north. The park pictured here is Georgetown Park and will be surrounded by residential and some retail/restaurant. So, Roswell.. let's build the Green! Let your leaders know you support City Green by adding your signature to our petition!